Already have an Account? Log-in or Log-out here. Already have an Account? 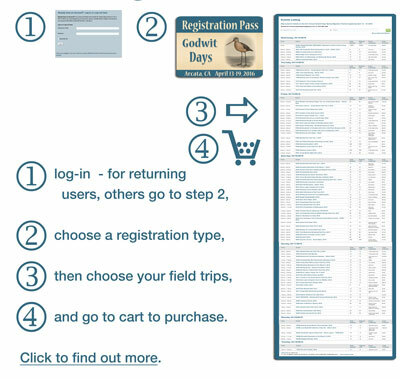 If you have purchased event tickets for Godwit Days events on-line in 2014 – 2017, you have already set up an account, and you will not need to create a new account; your account information should still be here – just log-in. If you have forgotten your password, scroll down this page and provide your email address in the field provided to receive a new one. If you are having trouble with this screen’s CAPTCHA, please try logging in using the WordPress log-in here. We are working on this problem. If you have any trouble with this process, please email (Web Administrator). Once you’re logged-in, you can check-out, select additional events or see what events you have booked. If you do not have an Account…. TO CREATE AN ACCOUNT If you have NOT registered for events since the 2013 season, you will have to create an account. Please follow the instructions below. Pick your events and the number of spaces you wish to reserve. You will be asked to enter each persons name wishing to attend the event. Lost your password or forgotten your username…. …. you can email us to get help (Web Administrator). The Administrator can look up your username but cannot see what your password was/is, but we can re-set it and email you a new password. For your security, it is recommended that you then re-set your password. Your email will be responded to as soon as possible.